The St. Louis metro area is one of many communities, says Gateway Writing Project co-director Katherine O’Daniels. The county is divided into 91 different municipalities, with most of its population existing outside of the city proper. In each of these communities, local elementary and middle schools feed into local high schools, leaving teens with few opportunities to meet and connect with students from outside their immediate bubble. As members of the Gateway Writing Project, O’Daniels and her team have firsthand experience forging connections across the region with the GWP’s Summer Invitational Institutes. At these institutes, K-college teachers from the area’s many districts converge at the University of Missouri-Saint Louis for a month of writing, inquiry, and professional growth. Recognizing the power that this metro-wide community building has had in their own lives, they set out to create a similar opportunity for the area’s teens. 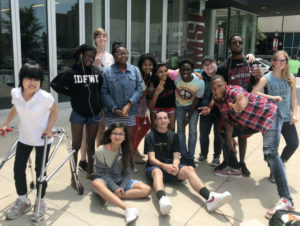 The result has been the OneCity Stories program, which for two summers has united a diverse group of high-schoolers from around the area for three weeks of writing, storytelling, making, and bonding. The team, headed by ELA teacher Diana Hammond and including teacher-consultants Cathy Griner, Randy Meyer, and Sioux Roslawski in addition to O’Daniels, set out to connect with a variety of “artists in residence;” local writers and media professionals who could bring their real world expertise to the summer experience. With these connections made, the team secured funding from an LRNG Innovators Challenge grant, and OneCity Stories was off. The LRNG Innovators Challenge grants are the result of a partnership between LRNG, powered by Collective Shift, the National Writing Project, and John Legend’s Show Me Campaign. The grants support educators and projects that are expanding the time and space for connected learning, a theory of learning that aims to connect school work to students’ passions, peers, and out-of-school worlds. One group produced an audio piece exploring the causes and consequences of racial segregation in their high schools. Another group filmed and edited an action movie trailer. Several groups wrote songs and filmed music videos. Students wrote powerful poetry about lost friendship, failing relationships and self-worth, and racism in America, alongside a horror short story and a personal essay about struggles with body image among high school athletes. All of these projects, along with many others, can be found on the OneCity Stories website. But great student work wasn’t OneCity Stories’ only goal, and it wasn’t its only result. The program was conceived as an opportunity for students to break out of their bubbles and build a cross-regional community, and on this count, year one was a learning experience. Due in large part to time constraints, the team had difficulty advertising their summer institute, and in the end most of the participants came to the program through a similar route. As the videos above can attest, this was no impediment to a great learning experience and excellent work, and two enthusiastic participants stayed in touch through the school year, participating in a middle school writing festival in March, and ultimately returning for the second summer as interns. But it did mean that the program hadn’t quite forged the connections the team was hoping for. With these lessons, and with a full year to plan, the team was able to take a more patient approach to recruitment for the second year, reaching out to Writing Project colleagues, advertising in local newspapers, and attending local summer program fairs. By the time June rolled around again, they had a strong and diverse group of 17 students, and the results were immediate. At the conclusion of the program the group put together a calendar of possible writing and social events to attend together throughout the school year to keep the connections strong. As always, the most powerful advertising for an experience like this is word of mouth, so the team is hopeful that with the enthusiasm from both students and parents this year, the program will continue to gain momentum. This momentum is also at play in recruiting the writers and media professionals who provide their stories and expertise to the summer institute. The team started out by cold calling and emailing everyone in the region they could think of, and once a few responded, they led to colleagues and associates. The final line-up included writers from the St. Louis Post-Dispatch, journalists from the local public radio station, a film programmer from Cinema St. Louis (organizers of the St. Louis International Film Festival), and the students’ favorite, local poet Jason Vasser-Elong. Finally, the team learned that while the expertise of the guest speakers is crucial, they couldn’t overlook the particular expertise that teachers bring to an experience like this. “We had five teachers working together, and we teachers knew when the students needed to be active, and get going, and get writing,” says Griner. In a world where many towns and neighborhoods are insular, and where many teens (and adults) seldom leave their bubbles, OneCity Stories is an example of how a new community can come together around passion-driven learning, storytelling, and making. Not only that, it’s a testament to the power of iteration, of making an only partially successful first attempt not a failure, but a foundation for future success. Join the LRNG Innovation Challenge!